I recently caught up with two members of Germany’s young winemaking generation in Edinburgh, when the city’s university was the final port of call in a nine date tour of british university wine clubs, organised by the Wines of Germany generic body. The idea was to introduce the UK’s wine enthusiast students to the newer styles of German wine being made by younger winemakers, with the winemakers from estates like Leitz of the Rheingau, Rudolf Furst of Franken and Pfeffingen of the Pfalz talking about, and pouring, their wines for the audience. 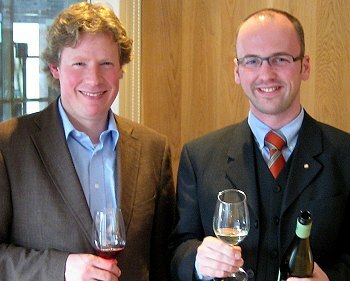 On this leg the task fell to Konrad Salwey of Weingut Salwey in Baden (left of picture), and Sebastian Oberbillig of Weingut Deutschherrenhof in the Mosel Valley (right of picture). The tour had taken in Oxford, Cambridge, Bristol and the LSE before wending its way north to finish with the universities of St Andrews and Edinburgh. I asked Konrad and Sebastian how it had gone, and both were impressed not just by the level of interest displayed by the students, but also their complete lack of any prejudice against German wines. It seems the notoriety of Liebfraumilch in the 70’s has bypassed this generation, who come to German wine without negative preconceptions. That’s not to say that Germany does not have a battle on its hands in terms of recognition: the fact that Germany made so many dry white wines not just from Riesling, but from Pinot Gris, Pinot Blanc and even Chardonnay was news to many. The fact that Germany makes increasing quantities of red wine was met with disbelief by some, though red varieties now account for 37% of Germany’s total grapevine acreage. Another interesting statistic suggests that Riesling – so long the favourite grape of many wine-lovers but one that made no impact on general consumers – has finally started to gain mass appeal. German exports have attained their highest ever volumes and the highest prices on record. 2006 saw lots rain in August and September (200mm in August) says konrad, so Botrytis and mildew problems meant leaving around 50% of grapes on the ground. Grapes for this wine grow on yellow limestone. It has a very attractive, peachy, soft nose with lovely mealy qualities and plenty of ripe stone fruit aromas. The fleshiness gives a plump softness, but there is lovely acidity and length with a touch of salty minerality adding a tangy, food-friendly freshness. 90/100. 12.5%. £9.60, Tanners. See all Salway stockists on wine-searcher. From the Pfalz, Pinot Blanc grown on chalky soils, is given yeast contact for six months. Very rich, quite exotic nose, with touch of banana and baked apple. The palate has some fat and weight, with plenty of ripe, mouth-filling fruit like pears and apple, with touches of apricot richness. There’s a note of Epsom salts in the finish, and lovely brightness and balance. 89/100. 12.5%. £11.55, Robert Anthony Wines. See all Pfeffingen stockists on wine-searcher. Lovely freshness and elegance. With racy lime fruit and a burgeoning sense of nectarine ripeness, but all restrained and classy. 87/100. Not yet in UK. Bottled in screwcap, this has a very fine and refined minerality on the nose, with little exotic fruit hints in amongst tangy apple skin and little salty notes. Lovely palate, with a fine sweetness and lovely ripe pear and some flowery, ogen melon notes. Beautiful acidity and shimmering length. Delightful. 91/100, 7.5%. £13.99, Booth’s, Christopher Piper. See all Leitz stockists on wine-searcher. From red sandstone vineyards, aged in older barriques. Very pale garnet colour, with a fine herbal and aniseedy note, and a lovely earthy, truffly character. On the palate there’s a tight, edgy character, with a gamy edge and tight, fine, beetroot and cherry skin fruit. Lovely silky tannins and a fine Pinot character here with good acidity. Terrific, but very young. 91/100. £24.00, Uncorked, Connolly’s, Larners. See all Furst stockists on wine-searcher.